Liitaal, by Aby Ngana Diop, is one of those recordings that sneaks up behind you, knocks you upside the head with a two-by-four, and leaves you dazed and bleeding on the sidewalk, wondering what hit you. 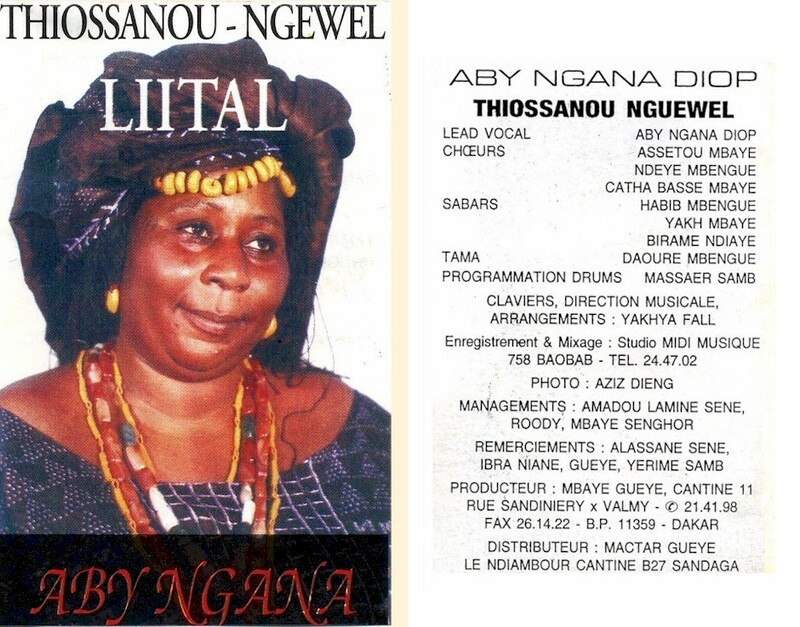 I know absolutely nothing about this Senegalese chanteuse, nor does anyone else, but that hasn't stopped those who have heard this early '90s cassette (apparently her only recording) from going absolutely bonkers (just Google her name if you don't believe me). Continuing the sporadic series "Dakar Divas," here is Liital in its two-fisted, glorious, astonishing entirety. Aby Ngana Diop - truly a singer worthy of the name diva! Update: Thanks to Matthew Lavoie from the VOA African Music Treasures blog, for providing some essential background information on Aby Ngana Diop and her music. According to Matt, Mme. Diop was born in the Dakar region and was the area's most famous tassukat (tassu being a form of sung Wolof rhythmic verse that is often used to impart traditional values to children). Matt writes, ". . . She performed in Europe a few times and appeared on stage with Doudou N'Diaye Rose. Most of her performances though were at baptisms and weddings in and around Dakar. Your post sparked my curiosity. I have been trying to learn more about her life. So far, I've come up short. I spoke with Mbaye Gueye, who produced the cassette, and he knew nothing about her. I've also spoken to several music journalists in Dakar. . . nothing. I'll keep you posted." Matt also reports that he's heard that Aby Ngana Diop passed away in the late '90s, between '96 and '98, although he can't confirm this.